I couldn't find this book anywhere in the bookshops here so I bought it online! This book was supposed to be out in December last year but was postponed to March this year. So excited to read the conclusion to The Dark Divine trilogy! SQUEEEEEEEEEEEEEEEEE! I finished reading this book last night and it was SO AWESOME. A GAZILLION TIMES AWESOME. Just finished reading this book. I really liked it! A very unique re-telling of Shakespeare's Romeo & Juliet. It's also very sad and heart-breaking. I love the simple cover! When I first saw this book, I had no idea how to pronounce the title but now I know you read it as Bezerk! Can't wait to read this since Braiden really liked it! Okay, that's all I got this week! What did you get this week? Just finished Until I Die . . . not too bad. I also didn't mind When You Were Mine. I'm jealous you got The Savage Grace - can't wait to read that book! Anyway great book haul! ENJOY YOUR NOMMY READS, CELINE! Woohoo! So much awesomeness! Yay for Until I Die and When You Were Mine! I'm curious to find out how you'll feel about both. Btw, I find it odd that I'd never seen that cover of Bitterblue before. I admit I haven't been paying too much attention, but I actually like it better than the other one. OOOh niiice!! I still have to read The Savage Grace, but have too many review books at the moment! 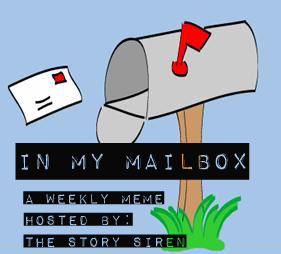 My Mailbox will be up tomorrow, so be sure to stop by then! I still haven't read anything by Kristin Cashore. I know, I know...book blogger FAIL! Lol. Awesome mailbox! I read BZRK a while ago and thought it was pretty good but not as great as Grant's Gone series. I hope you enjoy it! I've heard awesome things from nearly everyone about Rebecca Serle's book and now I can't wait to read it myself. :) Enjoy all your new reads! Glad you got BZRK Celine! Jen is great with sending stuff out ;) AHHH and Bitterblue! Me want me want... but I’m waiting for the US hardcover since I’m not a fan of these UK/AUS ones (although everyone else does). ENJOY READING them all -- especially BZRK! I'm excited to read When You Were Mine but sadly, I have to wait till its release. Boo. Anyway, I hope you'll have a lovely week. Cannot wait to hear what you have to say about When You Were Mine. I've been interested for a while... Happy reading! See what I got! I'm no longer doing IMM, but I'm still doing book hauls. Oh I have the first one of bree despain for a while but haven't read it yet. I hope you'll enjoy all your new books! Happy reading! I so very badly want to read Until I Die! Happy reading! UNTIL I DIE! Oh my gosh, I just finished that yesterday (I think? LOL!) and I completely loved it!! Like really, truly, epically loved in even more than I loved the first one! x) And then I saw that you have BITTERLUE (with all of your exclamation marks) and I had to squee along with you! I LOVE Kristin Cashore and I'm SOOO excited to my hands on that book, Celine! Eeeeeeee, I can't wait to read your review for it!! I plan to read Until I Die this week. I really want When You Were Mine. The US cover is completely different. Yay for The Savage Grace and Until I Die! I'm dying to read that one for sure! :) When You Were Mine sounds pretty awesome. I'm going to have to check that one out! What a great week, Celine! I keep hearing about Bitterblue but I have no idea what it's even about, I hope you enjoy it! I finished FIRE last night and it was every bit as amazing as I first thought and even more! <3 <3 Now there's no way I'm not buying Bitterblue right now. Wonderful IMM!! I loved BZRK....my first time reading any Michael Grant and I was blown away with his writing. Very intelligent writing, I had to take some notes. Blog Banner Design by http://thecutestblogontheblock.com/. Powered by Blogger.